Viewing 0 current events matching “ux design” by Date. Viewing 60 past events matching “ux design” by Date. We'll be heading to Green Dragon for our May round of food, drinks, and food. This month, Vitamin T has kindly stepped in to foot our beverage bill. Attendance might be limited, so just RSVP if you'd like to come! UX Happy Hour is a monthly event for anyone interested in user experience design. There's no agenda or talks, just a casual gathering of designers, researchers, developers, and more! Our first Networking Night of 2017 is a Saturday dedicated to AR and VR Project Showcases at the Creative Media & Digital Culture Center (CMDC) at Washington State University in Vancouver (WSUV). The Creative Media & Digital Culture (CMDC) program teaches students to conceptualize applications of digital technologies and to think critically about digital media and the ways humans interact and engage with them. On Jan. 28th, CMDC alumnae and current students will be showcasing AR, VR, 2D & 3D animations, websites, and a transmedia educational game environment that have been created for their own research or local community and cultural organizations. Experience and learn further about the creative and critical approaches CMDC students have used when working with digital technology. CMDC alumnae and current students. Join us for project showcases featuring AR, VR, 2D & 3D animations, websites, and a transmedia educational game environment. This is the first event we are organizing in the state of Washington. The event will be held on the beautiful campus of WSU Vancouver and we hope you will make the trip. The Creative Media & Digital Culture (CMDC) program offers a major and a formal minor leading to the Bachelor of Arts Degree (B.A.) in Digital Technology and Culture (DTC) at Washington State University Vancouver. It teaches students to conceptualize, in both research and practice, applications of digital technologies and to think critically about digital media and the ways humans interact and engage with them. The CMDC program focuses on six areas of study within the field of digital media: 1) web & mobile design & development, 2) 2 & 3D animation for simulation and visualization, 3) digital publishing, 4) physical computing, 5) social media / SEO for digital marketing, and most recently 6) game studies & design. With over 250 students in the CMDC, it is now recognized as one of five Signature Programs on the WSUV campus. Come join us for the first ever Algorithms Study Night March 6th at Code Fellows! We will be working on two problems, an easier starter problem, and then a more complicated one. Any and all skill levels are welcome. At the beginning of the meetup, we will post the questions on the slack channel, and after the meetup, we will post some of the solutions. Use our Slack Invite form if you would like to join Women Who Code, Portland Slack. This event will repeat first Monday of each month. Women Who Code is a global nonprofit dedicated to inspire women to excel in technology careers. We connect amazing women with other like-minded around the globe who unite under one simple notion--the world of technology is better with women in it. Mozilla is partnering up with Women Who Code Portland to host us during their Developer Roadshow series. The goal is to introduce technologies for the web that make it work. The night's program includes two talks on Web Security at Mozilla. Selena Deckelmann, head of Security Engineering for Firefox, will present a brief overview of her team's work and do a deep dive into recent work on integrating Tor patches into Firefox. Through a collaboration with Tor Project engineers and a team of Mozilla engineers spread around the globe, we've integrated 100+ patches into Firefox, and are working on many more. These patches are privacy-enhancing on multiple fronts, using features only available in Firefox. Michael Van Kleeck, Mozilla's Enterprise Solutions Architect, will talk about Mozilla's Identity and Access Management project, which is enabling Mozilla staff to seamlessly collaborate with community volunteers while at the same time keeping Mozilla and its mission safe. Using this as an example, Michael will introduce some of the technologies used, such as OIDC, OAuth 2.0, SAML, and LDAP. Join us on March 8th as we celebrate International Women's Day at Simple. Simple offers online banking with superhuman customer service and tools to help you easily budget and save, right inside your account. This workshop is for people who are completely new to the Command Line. We are going to cover the basic commands and concepts along with a few intermediate level network commands. We are going to offer more advanced level CLI, App Security and Open Source contribution classes in the future. This workshop will serve as a good foundation for those courses. This workshop is designed for MacOS and Linux users. All of the commands should work with Windows PowerShell as well. Please ensure that your Windows machine has the latest version of PowerShell. Richa Khandelwal has been writing code for the last 8 years. She is passionate about backend architecture and Machine Learning. She is an Technical Lead at Nike and a Lead for Women Who Code, Portland chapter. Women Who Code is a global nonprofit dedicated to inspire women to excel in technology careers. We connect amazing women with other like-minded individuals around the globe who unite under one simple notion--the world of technology is better with women in it. In Portland, we organize monthly study nights, workshops, and networking nights, as well as hackathons and social events. 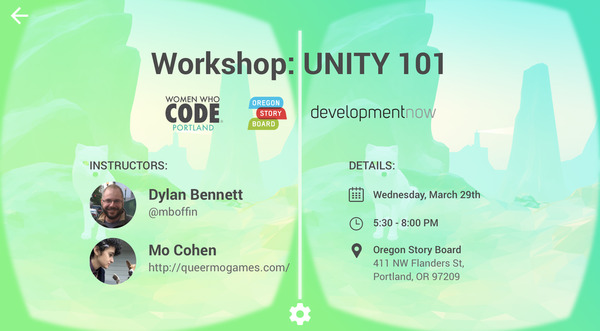 This Unity 101 workshop is for developers who are completely new to the Unity game engine. You'll get a basic familiarity with Unity's interface as well as learning the basic workflow of creating games in Unity. We'll then use those concepts to create a simple game. Although C# is the language used for Unity, we only require that you have some coding experience (in any language) so you can follow along with the basic ideas. We'll be writing some very simple C# code in the workshop, but you will have all the code in digital form beforehand in case some copy/paste is needed. By the end of the workshop, you should feel comfortable enough with Unity that you can start learning more on your own. You'll know enough about the Unity workflow that you'll have some idea of how to ask the right questions about what you don't know, and where to look for answers. Thank you Oregon Story Board and DevelopmentNow for sponsoring this event! If you run into any problems or have questions with the following steps, feel free to message Dylan via Twitter or the Slack for Women Who Code Portland (@mboffin on both). He'll be happy to help get whatever you're running into sorted out before the workshop, so you arrive ready to go. Dylan Bennett works in the field of education, teaching students programming and doing IT work. He runs the Portland Unity user group, UnityPDX, and is an officer for the Portland Indie Game Squad (PIGSquad). By day, Mo Cohen does functional programming at New Relic. By later day, she is building a point-and-click adventure game called Queer Quest (queermogames.com). And by night time, she's eating Nutella out of the jar. Join us on April 4th for our Networking Night @ Vacasa in the Pearl. 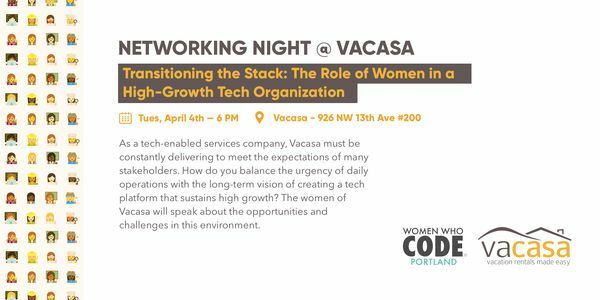 This month, the women of Vacasa will join us to discuss this month's theme - Transitioning the Stack: the Role of Women in a High-Growth Tech Organization. As a tech-enabled Services company, Vacasa must be constantly delivering to meet the expectations of many stakeholders. How do you balance the urgency of daily operations with the long term vision of creating a tech platform at sustains high growth? The women at Vacasa will speak about the opportunities and challenges for women in this environment. The team at Vacasa has made it their mission to make the world of vacation rentals a simple, stress-free experience for both owners and guests. May 11, 2017 Women Who Code Portland - Networking Night @ Second Story - "Make It Happen: Improvising, Collaborating, Prototyping"
On Thursday, May 11th, Second Story will host Women Who Code Portland’s monthly Networking Night in their new design studio. Second Story is a network of experiential design studios working across the cultural and brand landscapes to elevate the art of storytelling. They build stories you can step inside of. The theme for the night is Make It Happen: Improvising, Collaborating, Prototyping. The format of the night is an “around the world”; after the welcome, we will break into 3 smaller groups and each smaller group will attend every session offered. 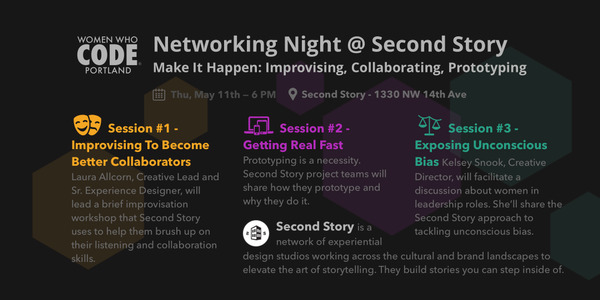 The night will be centered around how the team at Second Story works collaboratively, how they create prototypes that help them push the boundaries, and the leadership styles that make it all possible. We hope you’ll join us. Second Story is absolutely thrilled to host us in their new studio! Second Story is a highly collaborative studio making work that none of them could possibly produce on their own. Needless to say they have to be excellent listeners and collaborators. So that means they have to practice. Laura Allcorn, Creative Lead and Sr. Experience Designer, will lead a brief improvisation workshop that helps you brush up on our listening and collaboration skills. If the thought of this makes you nervous, please know this isn’t a performance and trying to be funny will be frowned upon. Prototyping is a necessity at Second Story. Their project teams will share how they prototype and why they do it. You’ll get a behind the scenes look at examples from projects with major museums and brands. Along the way they’ll share key learnings and show you how they evolved the experiences created. Kelsey Snook, Creative Director, will facilitate a discussion about women in leadership roles. She will share the Second Story approach to tackling unconscious bias with their Make Some Room campaign, an effort to increase inclusivity in the tech and creative fields. We are so thrilled to announce that on June 12th, we will be celebrating our 3rd Anniversary at New Relic! We are so thrilled to announce that on Monday, June 12th, we will be celebrating our 3rd Anniversary at New Relic! This is going to be a great event, as we are celebrating 3 years in Portland, 2000+ members, 200+ events, 10+ leaders, and so many wonderful memories! Thank you to New Relic, InVision, Nike, and Hackbright Academy for sponsoring. The theme for the night is "Rising Up in Engineering Leadership" and we have four distinguished speakers speaking about their careers and how to succeed and thrive in the tech industry as a woman. As a thank you to our wonderful members, we will have awesome giveaways for the first 100 people, so be sure to arrive on time! InVision and Nike have sponsored Women Who Code Portland coffee mugs and t-shirts and we will be serving food, drinks, and cupcakes, courtesy of New Relic and Hackbright Academy. Dana Lawson is the Vice President of Engineering at InVision, where she is responsible for leading the platform engineering group, covering DevOps, site reliability, and data services. She has nearly 20 years of experience as a systems engineer and has technical skills spanning multiple disciplines. Throughout her career, Dana has led many different teams and worn many hats, from an individual contributor creating mobile applications to leading multiple teams that managed large scale backend big data and infrastructure. With a background in fine arts, she brings her creative vision to the engineering team at InVision, where technology meets design. Meena Arunachalam is a Principal Engineer in Systems Technologies and Optimizations in Software Services Group at Intel Corporation and she leads system-level performance and power analyses in Machine Learning/Deep Learning and High Performance Computing segments for Xeon, Xeon Phi and FPGA products and architectures. Her areas of expertise are workload optimization, cache and memory hierarchies, and characterization, architectures and projections modeling and energy efficiency benchmarking. Meena joined Intel as a college graduate 18 years ago. She holds a Ph.D in Computer Science. She is a passionate advocate and mentor for women and underrepresented minorities in the areas of Science and Engineering both in industry and academia. She was the WIN (Women in Intel) Conference Chair in 2015 and is the Mentorship Committee Chair of the Women in Big Data West Coast Region. Sue Hayes is currently a Senior Director in the Nike Digital Engineering organization, responsible for the development of the Commerce Core capabilities that power Nike’s eCommerce stack and the brick-and-mortar stores. She has been with Nike for 20 years and she has managed software development teams across Nike’s enterprise. Sue graduated from Carroll University with Bachelor of Science degrees in Mathematics and Psychology and she earned an MBA from the University of Colorado. As a person with a lifelong passion for running, the offer to become a technology leader at Nike was a perfect fit! Our moderator, Vaidehi Joshi, is a Staff Engineer at Tilde, where she works on Skylight. She enjoys building and breaking code, but loves creating empathetic engineering teams a whole lot more. In her spare time, she runs basecs, a weekly writing series that explores the fundamentals of computer science. New Relic - New Relic's digital intelligence platform lets developers, ops, and tech teams measure and monitor the performance of their applications and infrastructure. InVision - The world's best companies use InVision to design the products you love. Nike - Experience sports, training, shopping and everything else that's new at Nike from any country in the world. Hackbright Academy - Hackbright Academy is the leading software engineering school for women founded in San Francisco in 2012. Our sponsors will have a booth during the events, where you can speak to representatives from those companies. 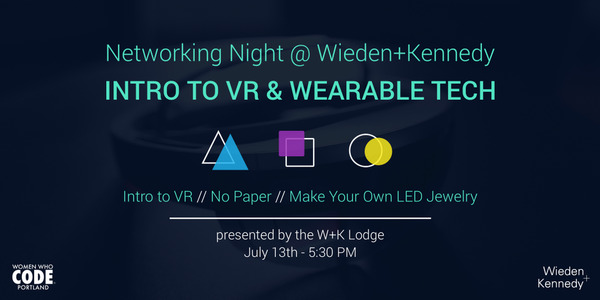 Our July Networking Night will be hosted by the W+K Lodge, a design engineering group that exists to shake up the way creativity works with technology at Wieden+Kennedy. This month's theme is Intro to VR & Wearable Tech and we have a fantastic program lined up! We are thrilled to invite you to a fun evening of virtual reality experiences, wearable tech, and food + drinks! There will be a series of workshops including an Intro to VR Development, a Live Art Demo of Google’s Tilt Brush app, and a Build Your Own LED Bracelet Wearable. And if you like donuts, there will also be a Donut Photo booth! 1. Intro to VR Workshop - A guided workshop on how to build your first very own VR app. The tutorial will be documented on video so that attendees can re-watch at home. A learning package will be prepared for attendees, where they can download online and get started. W+K Lodge is a design engineering group that exists to shake up the way creativity works with technology. It is a team of curious-minded experts in machine learning, interaction design, real-time graphics and other emergent parts of tech. The Lodge was founded by independent, privately held global creative company Wieden+Kennedy. They help their clients thrive in a meaningful impact on the future for the future, evolve organizations in a rapid product and support people by uncovering latent needs, behaviors and brands, and interactive experiences that transform the future, evolve organizations and grow. Read more here. They are a team of 25 designers, engineers and strategists who work on projects ranging from mobile apps, VR, platforms, installations, robotics, fabrication, electronics and more. A quick introduction to Docker, which might be helpful if you’re wondering what Docker is and why it’s garnered so much attention. Please note that the venue has changed. This month we will be at vevo (https://www.vevo.com/). Want to join our Slack team? Dev Ops Study Nights go on every 1st Wednesday of the month. Our Github repository for links to resources: https://github.com/wwcodeportland/study-nights/tree/master/devops-study-nights (https://github.com/wwcodeportland/study-nights/tree/master/devops-study-nights). It's pretty bare right now but we hope to be adding stuff to it in the coming months. By coming to the DevOps Study Night, you are agreeing to follow our Code of Conduct (https://github.com/WomenWhoCode/guidelines-resources/blob/master/code_of_conduct.md) (aka be a good human). This workshop is the first in our four part "Beginner's Guide to Open Source" series. This workshop is for people who are completely new to the Command Line. We are going to cover the basic commands and concepts with exercises. Bring: Your laptop and a power charger. • Understanding of bash and PowerShell. • Ability to use basic command line prompts. Come join us for Algorithms Study Night at Code Fellows! We will be working on two problems, an easier starter problem, and then a more complicated one. Any and all skill levels are welcome. At the beginning of the meetup, we will post the questions on the slack channel, and after the meetup, we will post some of the solutions. Use our Slack Invite form if you would like to join Women Who Code, Portland Slack. Women Who Code is a global nonprofit dedicated to inspiring women to excel in technology careers. We connect amazing women with other like-minded individuals around the globe who unite under one simple notion--the world of technology is better with women in it. In Portland, we organize monthly study nights, workshops, and networking nights, as well as hackathons and social events. Women Who Code Portland is thrilled to announce that our September Networking Night is being hosted by AWS Elemental, at their new office in downtown Portland! AWS Elemental is an Amazon Web Services company that combines deep video expertise with the power and scale of the cloud to provide nimble, flexible software-based video processing and delivery solutions. The event will be focused around the theme: Customer Obsession - The Art of Working Backwards. Speakers will demonstrate how they use their company's leadership principle, “Customer Obsession,” with their internal customers: their employees. This month, we are featuring a tech talk from AWS Training and Certification, a demo from AWS Elemental and two distinguished Amazonians sharing their experiences at the company. AWS Elemental solutions give video providers the power to quickly, easily and economically deploy and scale workflows and focus on what matters: transforming ideas into compelling content that captivates viewers. In 2006, Amazon Web Services (AWS) began offering IT infrastructure services to businesses in the form of web services -- now commonly known as cloud computing. Today, Amazon Web Services provides a highly reliable, scalable, low-cost infrastructure platform in the cloud that powers hundreds of thousands of businesses in 190 countries around the world. With data center locations in the U.S., Europe, Brazil, Singapore, Japan, and Australia, customers across all industries are taking advantage of agile, low cost, flexible and secure AWS technology platform. By coming to JS Study Night, you agree to follow our Code of Conduct. Allowing those with disabilities to experience your product or website effectively can be crucial to its success. As creators of experiences for others, we need to take responsibility and make sure the content we are generating is consumable by as many users as possible. Silas will share tools and tips that will help you evaluate the current state of your project and its accessibility, along with ways to change the way you think about design, allowing you to target a broader range of users. Come network with Portland's top digital marketing, design and optimization professionals at Buckman Public House located at Washington High School on the first floor. Don't forget to RSVP and spread the word. First round of drinks is on us with an RSVP! What is Camp Optimization? Camp Optimization's mission is simple: provide a casual, fun and informative forum for digital marketers and technologists to share optimization best practices, challenges and wins. Who is roboboogie? roboboogie is a Portland-based digital experience optimization agency partnering closely with brands to improve conversion rates, nurture brand advocacy and increase customer value. This month's networking night is a partnership between ChickTech and Women Who Code - we're delighted to bring our two communities together. Our November Networking Night will be hosted by CDK Global, the largest global provider of integrated IT and digital marketing solutions to the automotive retail industry. This month's theme is Growing Technically and Professionally, and we have a fantastic speaker panel lined up! We are thrilled to invite you to a fun evening of talks from experienced technical women, networking, and food + drinks. This month, we are featuring a five talks from five CDK software engineers, each of whom have diverse background and different seniority levels. Together, the engineers will create a framework for becoming a stronger technical team member, from breaking into the industry to developing a more advanced skill set on the job. Come enjoy conversations, Q&A session and the company of fellow software engineers. Senior engineer Claire Eremenis speaks about the CDK Summer Internship program, where CDK helped launch the technology career of college students. She'll provide advice on gaining your own internship, and how to enhance your own professional bio through summer intern mentorship. When you are new to a team, taking risks and self-growth can be difficult. This talk explores how to find that balance and become a strong member of a new team. CDK prides itself on creating a diverse team and a learning culture. This talk explore how to create an open and friendly culture, where engineers feel comfortable asking questions and junior engineers are encouraged to work with seniors and learn from them. Landing a job as a software engineer can be difficult. Mahjia Daliparthi shares her own personal story of becoming an engineer, busting myths about computer science and coding, and providing tactics that have helped her so far. This talk will cover learning how to learn fast, how best to spend free time at work, and becoming a sponge - absorb and absorb! CDK Global is the largest global provider of integrated information technology and digital marketing solutions to the automotive retail industry. We provide auto dealer software for truck, motorcycle, marine and RV from advertising to the sale, finance & insurance and service & parts of a vehicle. ChickTech is a multi-generational j/nonprofit dedicated to retaining women in the technology workforce and increasing the number of women and girls pursuing technology-based careers. In Portland, we lead technology events for middle school girls, high school girls, and career level folks! Join us for future ChickTech Portland career events including technical classes, social events, and our signature conference ACT-W (achieving career advancement for technical women. This workshop provides an introduction to digital accessibility standards and practices and gives participants hands-on experience with assessing, testing, and implementing accessibility practices in the physical and digital realm. We’ll start this workshop by talking about what accessibility entails: why it matters, and who is excluded when we don't adapt our online and physical spaces to account for varying ability levels. Then, we'll explore the business case for developing accessible technology. Isn't your business (your art project, your retail store) going to be more successful if everyone, regardless of their ability, can access and enjoy it? Next, we’ll dive into the technical details with a straightforward overview of the latest accessibility standards (the new 2018 Revised 508 Standards, the first major update since 2001, and the W3 WCAG standards). Then, we’ll work in small groups to practice hands-on accessibility testing. Finally, we’ll reconvene, share our progress and findings, and develop plans for implementing accessible development in our day-to-day work. Instructor: Amelia Abreu is a design researcher and the founder of UX Night School. She's worked with clients like Nike, Mozilla, Microsoft, and Intel. Before entering the industry, she did graduate research in Human Computer Interaction at the University of Washington. Women Who Code Portland and LaunchCode are thrilled to present a cross-country online series focused on women in tech exchanging stories, building connections, and supporting each other in their careers. The series will be called "Tech Stories: Women Sharing Their Journeys" and it will take place the last Tuesday of the month. Each session will feature a conversation with a woman in a senior tech role. Our speakers will talk openly about their current role, their journey, and what their day-to-day work lives are like. We will alternate speakers from the Portland and St Louis communities. Link to join the Zoom event: https://zoom.us/j/4266077134. By dialing in to this event, you agree to our Code of Conduct. Women Who Code (WWCode) is dedicated to providing an empowering experience for everyone who participates in or supports our community, regardless of gender, gender identity and expression, sexual orientation, ability, physical appearance, body size, race, ethnicity, age, religion, socioeconomic status, caste, or creed. Welcome to our DevOps Study Night! Throughout 2018, the WWC PDX study nights will weave through an introductory overview of systems administration. This month, we'll take a look at Amazon Web Services (AWS) and Google Cloud Platform (GCP), two of the main providers of cloud infrastructure services. The DevOps Study Nights occur on the first Wednesday of each month. HAVE YOU JOINED OUR SLACK COMMUNITY? Our Github repository for links to resources: https://github.com/wwcodeportland/study-nights/tree/master/devops . It's lightweight right now but we will add to it in the coming months. By coming to the DevOps Study Night, you are agreeing to follow our Code of Conduct: https://github.com/WomenWhoCode/guidelines-resources/blob/master/code_of_conduct.md (aka be a good human). Thanks to Act-On for sponsoring and hosting us! By coming to JS Study Night, you agree to follow our Code of Conduct (https://github.com/WomenWhoCode/guidelines-resources/blob/master/code_of_conduct.md). 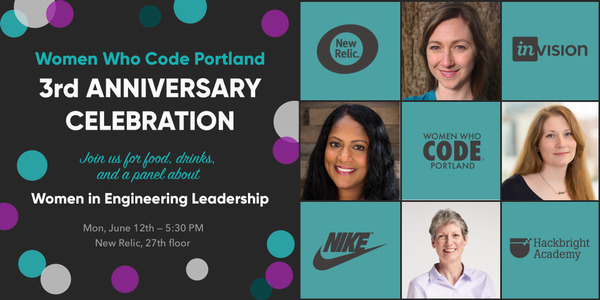 On Monday, June 18th, Women Who Code Portland will be celebrating 4 years in Portland! 🥂 Join us for our 4th Anniversary Celebration, an evening of networking, great talks, giveaways, and delicious food and drinks, hosted by New Relic. The theme and the speakers will be announced in the next few weeks leading up to the event! Stay tuned! As a thank you to our wonderful members, we will have an awesome Women Who Code t-shirt to give away to our first 100 attendees and we will be raffling conference tickets and other cool prizes to all attendees. Women Who Code (WWCode) is dedicated to providing an empowering experience for everyone who participates in or supports our community, regardless of gender, gender identity and expression, sexual orientation, ability, physical appearance, body size, race, ethnicity, age, religion, socioeconomic status, caste, or creed. Our events are intended to inspire women to excel in technology careers, and anyone who is there for this purpose is welcome. Because we value the safety and security of our members and strive to have an inclusive community, we do not tolerate harassment of members or event participants in any form. Our Code of Conduct (https://www.womenwhocode.com/codeofconduct) applies to all events run by Women Who Code, Inc. If you would like to report an incident or contact our leadership team, please submit an incident report form (http://bit.ly/wwcode-incident-report). 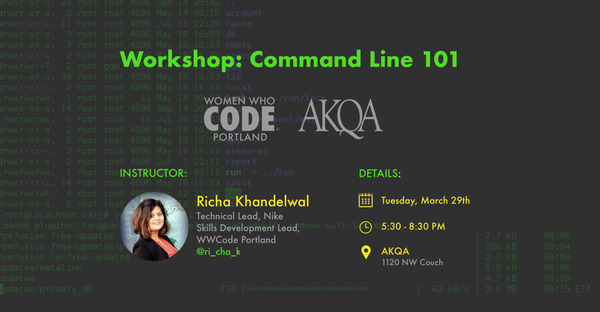 Throughout the year, the WWCode Portland DevOps Study Nights will weave through an introductory overview of systems administration. This month, we will take a look at Amazon Web Services (AWS) and Google Cloud Platform (GCP), two of the main providers of cloud infrastructure services. The DevOps Study Nights take place on the first Wednesday of each month. This month Stacy will speak and guide us through on high level conversation on Server Security. Stacy is a Senior Security Automation Engineer at Randstad at Nike. She is passionate about fostering a grounding in security, testing, and development best practices. Anyone can learn these skills when they put their mind to it. She likes to foster that mindset in the people she mentors. She has developed microservices, automation, orchestration and monoliths. She enjoys posing the question "what is devops?" and the ensuing discussion. No two answers are the same. She enjoys reading man pages for fun, singing in the Aurora Chorus, and running about 20 miles a week. Thank you vevo for hosting and sponsoring our DevOps study night. - Follow our GitHub repository with links to resources: https://github.com/wwcodeportland/study-nights/tree/master/devops. By coming to our DevOps Study Night, you agree to follow our Code of Conduct (https://www.womenwhocode.com/codeofconduct). Join Women Who Code Portland on Thursday, August 16th for a Networking Night @ Mozilla, with Women in InfoSec as the theme. This event will feature a panel of distinguished and experienced women from the security field. Our panelists will discuss how they initially landed in InfoSec, what the different roles are, and how someone could enter this field. According to the Women's Society of Cyberjutsu (WSC), only 11% of the world's information security workforce are women. With this event, we are aiming to expose more women to the opportunities in InfoSec and hopefully encourage some of our attendees to apply for roles in InfoSec. Joan Pepin is the Chief Information Security Officer (CISO) at Auth0. As CISO, Joan is responsible for the holistic security and compliance of Auth0's platform, products, and corporate environment. She brings 20 years of experience to the role, with a career that has spanned a wide variety of industries, including healthcare, manufacturing, defense, ISPs, and MSSPs. LJ Johnson is a well-known security industry leader within the local Portland community. For the past 20 years, LJ has held several roles within Nike’s Information Security organization as well as holding leadership positions in Business Operations, Organizational Change Management, Global Supply Chain, Application Development and eCommerce. Having a holistic background in both business operations and technology delivery has allowed LJ to deliver security solutions and services with real business results. Miki Demeter is a Security Researcher at Intel. Her career has encompassed everything from firmware to the application space. In the last eight years, Miki has focused on security as the Security Champion for the Open Source Technology Center @ Intel. In her current position as a Security Researcher, she works on Secure Development Lifecycle governance and as a Product Security Expert for Open Source Software. Miki strives to instill a security first attitude in products, by working with developers to make informed choices when using Open Source. More information on the speakers is available on the Eventbrite page. Hey! This is the Design + Product Study Night. We are folks that work in the product space, want to develop new skills related to product development, or are looking for our first job in product. You don't need to be a product designer or manager, or have any experience to come. Only interest and a willingness to help others is required! • Interest in product design or product management. • Build a richer community around product thinking and product design in Portland. • Develop your skills in this space. • Meet like-minded people doing similar work. • Career development in product and design. - The D+PSN will take place every 3rd Tuesday of the month at Lithium Technologies. By coming to our Design + Product Study Night, you agree to follow our Code of Conduct (https://www.womenwhocode.com/codeofconduct). Aug 23, 2018 Introducing "Placemaking in the Digital Age"
Amplified, an experience design and technology innovation studio in Portland focused on imagining the communities of the future, is launching a new series called “Placemaking in the Digital Age” to galvanize a community around this emerging design discipline. In this series, we will discuss how we can build meaningful places where digital and physical experiences complement each other, examine design processes and methodologies, and examine the nature of design teams that create these experiences. Join us on Thursday, August 23 as we kick off this series. Gregg Sloan, Founder and Chief Creative Officer and Janani Vasudev, Director of Experience Design at Amplified will introduce the series with a talk about what placemaking is, as well as discuss their work in the area. The 45-minute talk will be followed by a Q&A, with plenty of time in the beginning and at the end to network. Complimentary refreshments will be provided. This event has a seating limit of 30 people. Please don’t forget to RSVP to save a spot! Ann Wallace is a Technical Cloud Consultant at Google focusing on kubernetes, security and SRE. Before Google, Ann spent 14 years at Nike in various engineering and architecture roles. CloudNOW named her one of the top 10 Women in Cloud in 2015. When not working, Ann can be found traveling and ultra-trail running. Our September Networking Night will be hosted by the women within the Open Source Technology Center at Intel. The theme of the night is ✨ Women Who Open Source ✨. Join us for lightning talks on Open Source, Artificial Intelligence, Chrome, Data Center and Cloud Environment, and Security, and dinner at McMenamins. Kelly Hammond -- What does it mean to be open source, and why should software developers want to work in open source? Kristen Accardi -- Micro-architectural side channel attacks are here to stay. What can we do inside the operating system to defend against them? Margarita Maroto -- Chromebooks have evolved into premium devices with advanced features and high adoption. Monica Ene-Pietrosanu -- Cloud computing, containers, runtime languages, and software orchestration. More information about each talk and speaker is available on the Eventbrite page. By attending this event, you agree to follow our Code of Conduct (https://www.womenwhocode.com/codeofconduct). Kathi Kellenberger has been involved with technology for over twenty years, with most of that time focused on SQL Server and the Microsoft Data Platform. She has written several books, articles and courses on SQL Server topics and loves to present at conferences around the world. She is co-leader of the Women in Technology Virtual Chapter for the PASS organization and an instructor in the LaunchCode CoderGirl program. She is currently editor of Redgate's online technical journal, Simple Talk. Open Source Study Night is specifically designed for people who would like to start contributing to open source, or have open source work that they'd like to do with others. This month's theme: Security and Open Source. This month's study night will feature a presentation by Michaela "Miki" Demeter, Security Researcher at Intel! When looking at open source packages, how do you decide what to incorporate and what to leave behind? Ultimately, your goal is to minimize your company and your teams' exposure to risk. “Minimizing risk” doesn't mean analyzing every line of code, but does involve evaluating a project's community. Can you trust them to do work at the quality that you can feel comfortable with in your releases? Are they doing proactive security work and fixing bugs quickly? Miki has worked for the Open Source Technology Center at Intel for 5 years, and is an expert on open source communities. You'll walk away with a better understanding of how to choose open source libraries for your projects. * Git/GitHub or GitLab. If you don't know git, we'll teach you! Thanks to our sponsor, Planet Argon, for hosting this event. The DevOps Study Nights take place on the first Wednesday of each month. For October, the topic will be managing security and compliance regulations. - 6PM to 7PM - Presentation about considerations regarding security and compliance for data. Why do we need to protect our servers, and how can we do it to meet our needs? Certificates versus SSH versus passwords. Encryption! - 7PM - 8PM - We'll spin up a server and connect to it using a password, SSH, and a certificate. Women Who Code Portland is pleased to announce an Intro to Voice Technology, in partnership with Women in Voice. This talk & hands-on workshop will be lead by Joan Palmiter Bajorek, the Founder of Women in Voice. - How do Alexa, Ok Google, and Siri work (voice assistants)? - Why is voice taking off right now? Is that related to artificial intelligence? - What does it take to build my own Alexa skills and Google actions? - Why does this matter in the big scheme of things? This talk is for a general audience, but we will also explore technical topics of natural language processing, machine learning, and neural networks. No coding experience required. We will live-stream this event: link TBA. Joan Palmiter Bajorek is the Founder of Women in Voice (https://womeninvoice.wordpress.com/). She is a Speech Technologist and PhD Candidate at the University of Arizona. Exploring speech recognition and virtual reality in educational technology, i.e. Duolingo, Rosetta Stone, she is the Principal Investigator of an international team in collaboration with the startup ImmerseMe. Her research has been published by Cambridge University Press, The Linguist List, The FLT Mag, and Issues and Trends in Educational Technology. As a public speaker, she has recently spoken at VOICE Summit by Amazon Alexa, [email protected], iSpace Tech Talks, American Association of Applied Linguistics, R-Ladies, Rosetta Stone, Computer Assisted Language Instruction Consortium, and the podcasts “This Week in Voice,” “The Vocal Fries,” and “Voice & Beyond.” She holds an MA in Linguistics from the University of California, Davis and undergraduate degrees from the University of Washington. Inspired by Stephanie Hurlburt's cupcakes and math meetup in Seattle, we've started a cupcakes and math club here in PDX. Commitment: Have fun. There's no need to show up regularly, on time or stay the whole time. It's a chill, "drop in whenever you feel like you need some math in your life" event. What To Bring: Bring a math textbook you want to do problems from (or a laptop with online learning materials). If you don't feel comfortable working with math, that's fine. Bring a program that's giving you trouble, or a computation-related side project. What Will Happen: You'll sharpen your math skills while eating cute pastries next to other ladies doing the same thing. We can work quietly, ask for help from others or talk about a cool thing you just learned. Event Specific: This is a physical and psychologically safe place. People of all skill levels are welcome, and beginners will be treated with kindness and respect. Anyone who identifies as female or non-binary is welcome; there will be no discrimination, harassment or comments that make others feel unwelcome. If you feel uncomfortable at any point, please email me @ [masked] or pull me aside during the meetup. Oct 18, 2018 Women Who Code Portland - Open Source Study Night: Hacktoberfest! Hacktoberfest! Let's celebrate open source over food, drinks, learning, and great company. Commit your first PR to an open source project, or submit new PRs to win prizes. We'll also be raffling off prizes to participants at this event - come ready to win swag! We'll have two 20-minute talks, each followed by 10 minutes of Q&A. We'll have plenty of time at the start and end of the meetup for tasty beverages and networking. As a product manager, you may have different types of feedback and data from product users/customers. Some of that could be Net Promoter Score (NPS) results, e-commerce data, community media verbatims, or other survey information. Learn what’s going on with NPS and other customer data to look at it from a product use perspective. Then see how to translate that into making changes to your product to better connect with customers, improve your value proposition, and make more revenue. Camila Morrison is a product manager in tech who has worked across a variety of areas in product management from concept/market/UX roles to managing a team in the development arena. Also in her experience, is running a Net Promoter System to drive improvements across the customer product lifecycle. She was in marketing management for companies that included utility control center software. Her background includes leading marketing research projects for tech, utility, transportation, ad/media, healthcare, retail, tourism, and non-profit industries. After spending many years as a product manager in both large and small organizations, Mike would like to share the application of a tool we use in our day job to our career. Mike began in software development and fell into the product manager role – initially informally and then formally. He has worked in a number of B2B and B2C markets including graphics processors, networking systems, digital media, educational software and currently fintech. One item on his bucket list is to master all 37 activities on the Pragmatic framework or to visit all 50 states in the US. Mike is also one of the ProductCamp Portland co-founders, an annual product management un-conference that began in 2012. It provides him with the opportunity to create a new product every year and in doing so, apply a wide range of product management skills that he rarely gets to exercise. Get to grips with the basics of electronics. In this self-guided workshop, you will learn how to use the fundamental building blocks that create circuits, such as leds, jumper wires, bread board, resistors, batteries, switches, buttons, sensors and more! Andrew Chalkley (@chalkers) is a Full-Stack Software Architect at eBay, Co-Host of That Maker Show, project lead of thingsSDK and technical writer at Screencasts.org. He's been dabbling in electronics since 2012, given classes and lectures around the United States including at the Rochester Institute of Technology. David Wang (@planetbeing) is a co-founder of Corellium, a startup working on the virtualization of mobile devices and leveraging that technology for security research. Previously, David has created hardware and software for a home automation hub called Solace. He has also contributed to Homebridge and authored plugins for it. He continues to be a home automation enthusiast, and works to either cajole or reverse engineer every single device in his house into joining a coherent system. This month's topic will focus around web speech APIs from guest speaker Caterina Paun. The Web Speech API allows you to incorporate voice within your web apps. With this free API, you can take in voice input through speech recognition and/or you can use speech synthesis to output voice. During this session, we will go over how you can take advantage of this API and build voice applications. Caterina is a developer and designer focusing on voice technologies. She is currently an Instructor at Portland State University and the Senior Director of Women Who Code Portland. We're re-booting UX Book Club in the new year with something a little different! Fan favorite Amber Case will be hosting us (address will be sent to attendees) and giving a presentation on her new book Designing with Sound (and likely her other recent book Calm Technology). Amber Case studies the interaction between humans and computers and how our relationship with information is changing the way cultures think, act, and understand their worlds. Case has spoken, performed and written about the future of sound design at conferences and events around the world. Case is also the author of Calm Technology (O'Reilly, 2015). She lives in Portland, Oregon and online @caseorganic. Aaron Day (who will not be in attendance) has been designing sound experiences and interfaces since 1998. He has worked for clients including Bruel & Kjaer, Fiat, Ferrari, Maserati, Wire, Mozilla, Qoros, Telefònica, Bosch, Vodafone, Sprint, Siemens Audi and Samsung. Aaron lives with his family in Berlin, Germany. All participants must read and abide by the Event Code of Conduct. Be respectful of other people, respectfully ask people to stop if you are bothered, and if you can’t resolve an issue contact organizers. If you are being a problem, it will be apparent and you’ll be asked to leave. Additionally, we respectfully ask that you do not tag the venue on social media. Welcome to our Design Study Nights! Throughout the year, we will cover various design topics in these events. In January, our theme for the Design Study Night is: Building Your Portfolio. We will have one speaker describe the process of doing a portfolio redesign and what projects to include. Then, we will have two hiring managers speak about what they are looking for in your portfolios. The Design Study Nights take place on the second Wednesday of every other month. They will alternate with our brand-new CSS Study Nights. Come learn about Mozilla’s Project Things initiative. It is an open source implementation aimed at promoting a decentralized, and W3C-standardized, Web of Things framework for managing IoT device data. Mozilla’s implementation puts people first, protecting user privacy and security, while promoting industry interoperability. Attendees will learn how to set up a private IoT gateway, and how to to program MCU hardware by following an online tutorial, that takes advantage of open source “webthing” libraries. Attendees will be lent a developer board that they can program during the workshop, and continue to learn from later by referring to an online tutorial. Prototyping hardware is generally low cost, and readily available. Kathy Giori is a Senior Staff Evangelist at Mozilla, promoting "Project Things," an open source Web of Things implementation which embodies Mozilla's values around privacy, security, and interoperability. In previous roles at Arduino.org, Qualcomm Atheros, and other startups, she has been promoting the benefits of open hardware and software, and finds that bridging open communities with industry drives faster innovation. She received her bachelor's degree in Electrical Engineering from the University of Minnesota, and her master’s in EE from Stanford. Our Code of Conduct applies to all WWCode events and online communities. Read the full version at http://www.womenwhocode.com/codeofconduct. If you would like to report an incident, please reach out to one of our volunteers or submit an incident report form: http://bit.ly/wwcode-incident-report.mit an incident report form (http://bit.ly/wwcode-incident-report). Women Who Code Portland and LaunchCode are thrilled to present a cross-country online series focused on women in tech exchanging stories, building connections, and supporting each other in their careers. The series will be called "Tech Stories: Women Sharing Their Journeys" and it will take place the fourth Tuesday of the month. Marion Marschalek is a former Malware Analyst and Reverse Engineer who recently started work at Intel in order to conquer the field of low level security research, where she nowadays spends an unusual amount of time looking at compiler source code. She has spoken at all the conferences and such, and seen all the things, and keeps eagerly seeking more wisdom. She is proud member of the Blackhat review board family, and has been mentioned by Forbes in their 30under30 list for technologists in Europe in 2016. Also, she runs a series of free reverse engineering bootcamps for women titled BlackHoodie, because the world needs more researcherettes. Using good design is important when we want to convey our ideas or start building a new product. But it can be difficult to grasp the basics of design and find the right design tool. This workshop walks through basic designing, animating and prototyping tips using InVision Studio (https://www.invisionapp.com/studio) as our design tool. Keeley Hammond is a senior software engineer at InVision, and a member of the InVision Studio engineering team. In 2019, Women Who Code Portland is debuting a new event series focused on learning more about the security field. Welcome to our Security Study Nights! Our first Security Study Night will be a Capture the Flag (CTF) 101. What is Capture the Flag and why do security professionals play it? The short answer is that it allows them to hone their skills and have fun. There is an entire subculture that exists around CTFs. So if you want to learn how to think like a hacker, adapt your skills and learn on the fly, come to our CTF 101 Study Night to see what it is all about. You will get a chance to capture your first flag. Miki Demeter is a Security Researcher at Intel. Stacy Watts is a Senior MSS Platform Engineer at BlueVoyant. The talk of the town in theories of behavior change in technology center on centuries old behaviorism, such as BJ Fogg's Behavior Model or Nir Eyal's Hook Model. But, what if you're trying to precipitate a user behavior that's complex? That happens over long time domains? That isn't immediately rewardable? How do you support users in finding the motivation to interact with your product, when push notifications just won't do the trick? I'll talk about how we applied the science of motivation, Edward Deci's self-determination theory, to product design at Conversa Health, for outsized gains in patient engagement, retention, and NPS. Jahed heads up the product team at Conversa Health, an automated care management chatbot for health systems, leading them to successful A and B rounds of funding during his tenure. Before, he led the product growth team at Zoomcare, where he increased revenue and visits 240% over 18 rapid fire months, leading up to their acquisition by Peace Health. Before that he worked with Dan Ariely of Predictably Irrational fame on applying behavioral economics to projects within Google, and worked in the adtech industry applying behavioral science to ad units (he's not proud of this work). Way before then, he played poker professionally for a few years after grad school, where he completed an MS in Physics at the University of Illinois, Urbana-Champaign.